FET, also called unipolar transistor is a transistor used to control the electrical behaviour of a device. FET has a very high input impedance (100 Mega ohm in case of JFETs and 104 to 109 Mega Ohm in case of MOSFETs), the major shortcomings of an ordinary transistor i.e. low input impedance with consequent of loading of the signal source are eliminated in FET. Hence FET is an ideal device for use in almost every application in which transistors can be used. FETs are widely used as input amplifiers in oscilloscopes, electronic voltmeters and other measuring and testing equipment because of their high input impedance. As a FET chip occupies very small space as compared to BJT chip, FETs are widely used in ICs. FETs are used as voltage-variable resistors (WRs) in operational amplifiers (op-amps) and tone controls etc, for mixer operation on FM and TV receivers and in logic circuits. FETs are generally used in digital switching circuits though their operating speed is lower. noise may wipe out the picture. Noise is independent of the signal strength because itÂ exists even when the signal is off. Every electronic device produces a certain amount of noise but FET is a device which causes very little noise. This is especially important near the front-end of the receivers and other electronic equipment because the subsequent stages amplify front-end noise along with the signal. If FET is used at the front-end, we get less amplified noise (disturbance) at the final output. A buffer amplifier is a stage of amplification that isolates theÂ preceding stage from the following stage. Source follower (common drain) is. used as aÂ buffer amplifier. Because of the high input impedance and low output impedance, a FETÂ acts an excellent buffer amplifier, as shown in the figure. 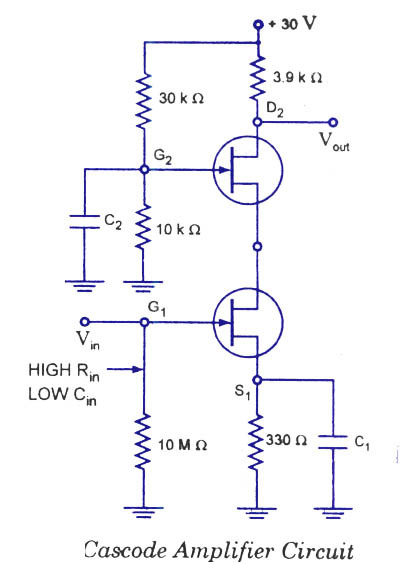 Owing to high input impedance almost all the output voltage of the preceding stage appears at the input of the buffer amplifier and owing to low output impedance all the output voltage from the buffer amplifier reaches the input of the following stage, even there may be a small load resistance. Circuit diagram for a cascode amplifier using FET is shown in figure. A common source amplifier drives a common gate amplifier in it. The cascode amplifier has the same voltage gain as a common source (CS) amplifier. The main advantage of the cascode connection is its low input capacitance which is considerably less than the input capacitance of a CS amplifier. It has high input resistance which is also a desirable feature. Since RD is very large in comparison to RDS 0N), so Vout can be taken equal to zero. When a negative voltage equal to VGS (OFF) is applied to the gate, the FET operates in the cut-off region and it acts like a very high resistance usually of some mega ohms. Hence output voltage becomes nearly equal to input voltage. A direct-coupled amplifier can be built by leaving out the coupling and bypass capacitors and connecting the output of each stage directly to the input of next stage. Thus direct current is coupled, as well as alternating current. The major drawback of this method is an occurrence of drift,Â a slow shift in the final output voltage produced by supply transistor, and temperature variations. The drift problem can be overcome by employing a chopper amplifier as illustrated in the figure. (a). Here input dc voltage is chopped by a switching circuit. The output of the chopper is a square wave ac signal having peak value equal to that of input dc voltage, VDC. This ac signal can be amplified by a conventional ac amplifier without any problem of drift. Amplified output can then be ‘peak detected’ to recover the amplified dc signal. A square wave is applied to the gate of a FET analog switch to make it operate like a chopper, as illustrated in theÂ other figure. The gate square wave is negative-going swing from 0 V to at least VGS (off)- This alternately saturates and cuts-off the JFET. This output voltage is a square wave varying from +VDC to zero volt alternately. If the input signal is a low-frequency ac signal, it gets chopped into the ac waveform as shown in last figure (c). 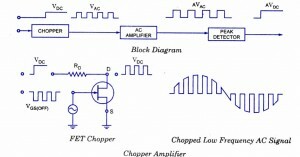 This chopped signal can now be amplified by an ac amplifier that is drift free. The amplified signal can then be peak-detected to recover the original input low-frequency ac signal. 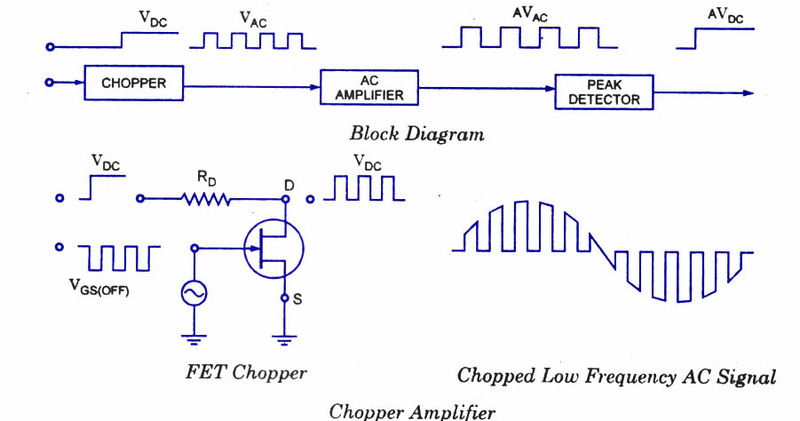 Thus both dc and low-frequency ac signals can be amplified by using a chopper amplifier. 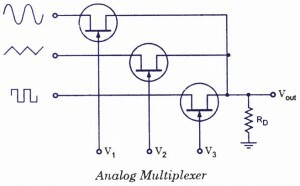 An analog multiplexer, a circuit that steers one of the input signalsÂ to the output line, is shown in the figure. 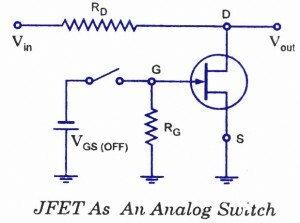 In this circuit, each JFET acts as a single-pole-single-throw switch. When the control signals (Vv V2 and V3) are more negative than VGS(0FF) all input signals are blocked. By making any control voltage equal to zero, one of the inputs can be transmitted to the output. For instance, when Vx is zero, the signal obtained at the output will be sinusoidal. Similarly, when V2 is zero, the signal obtained at the output will be triangular and when V3 is zero, the output signal will be square-wave one. Normally, only one of the control signals is zero. JFET current limiting circuit is shown in the figure. Â Almost all the supply voltage, therefore, appears across the load. When the load current tries to increase to an excessive level (may be due to short-circuit or any other reason), the excessive load current forces the JFET into the active region, where it limits the current to 8 mA. 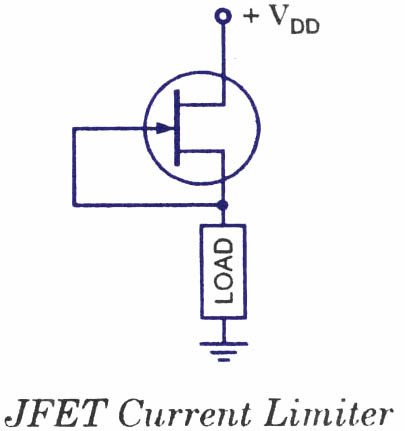 The JFET now acts as a current source and prevents excessive load current. 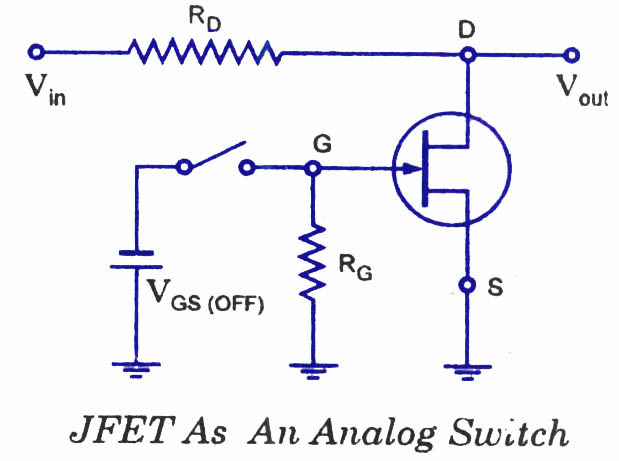 A manufacturer can tie the gate to the source and package the JFET as a two terminal device. This is how constant-current diodes are made. Such diodes are also called current-regulator diodes. JFET can incorÂ­porate the amplifying action as well as feedback action. It, therefore, acts well as a phase shift oscillator. The high input impedance of FET is especially very valuable in phase-shift oscillators in order to minimize the loading effect. 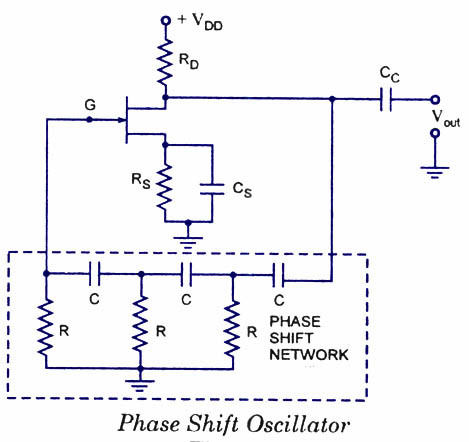 A typical phase shift oscillator employing N-channel JFET is shown in the figure. What is the value of Resistance in JFET multiplexer?And What model of JFETs do we need tp use in this experiment?? sir i want to know fet transister use in replace of transister.i have lot a fet . 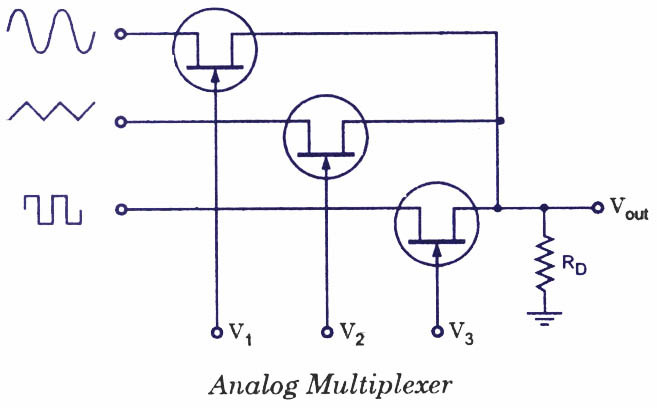 What is the value of Rg to be chosen for the analog switch circuit?